Here is the preview of the Cake Fox gift for the Steam hunt March 1-31st! Cake Fox Garden Ship Wheel and Chain is a decorative item you could use on your beach or underwater, or even just in a nautical themed club, maybe. It is all linked mesh and 3 Li. 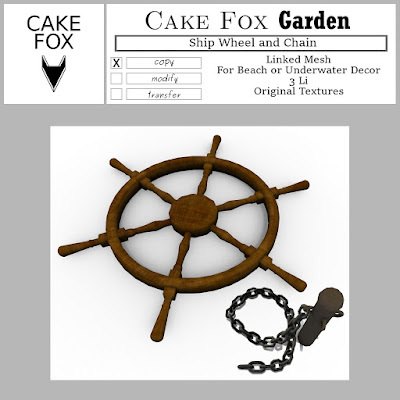 Get it at the Cake Fox Mainstore.